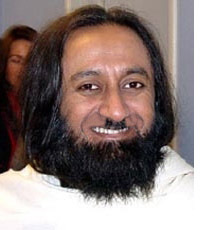 Congress general secretary Digvijay Singh on Friday fired a fresh salvo at Art of Living guru Sri Sri Ravishankar, saying the spiritual guru is the "C grade worker of the Rashtriya Swayamsewak Sangh (RSS)". While we realize this is just politics, let us point out that this is just politics, not spirituality in any form that we care to recognize. It's just another par on the course for the famous fauxru on his seemingly insatiable charge for more money, power, and influence in Bharat.